While the focus of gift-giving holidays may take place in winter, however the spring has its fair share of things to celebrate. For many people, Easter is the next major holiday and it can be a great time for parents to share stories with their children while also sharing something a little special as well. Easter coincides with the beginning of spring, and with good reason. Parents can use this meaningful holiday to emphasize the circle of life and to relay other messages, but like many other holidays it can be a great opportunity to take advantage of storytelling. Strapped for Easter gift ideas? KD Novelties is having an Easter Giveaway. Enter to win a variety of Easter gifts that are sure to make any Easter basket complete. 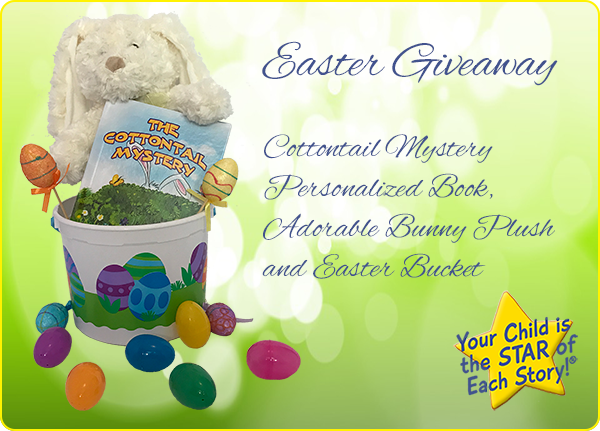 In the giveaway, KD Novelties will include The Cottontail Mystery personalized book, an Easter Bunny plush and an Easter bucket as well. Not only do the prizes have your Easter gift-giving work cut out for you, but the giveaway helps to promote literacy as well. With personalized books like The Cottontail Mystery, kids can embark on their own adventure alongside the Easter Bunny himself. Full of springtime charm, this book uses puzzles and other sorts of clues to engage kids in a mystery surrounding the Easter Bunny. By personalizing the book, the story becomes more immersive and interesting, especially for kids who may not otherwise like reading or need a little extra push to do so. Personalized books have proven to be a great gateway to reading other books and promoting a general interest in reading and learning, even among reluctant readers. With The Cottontail Mystery and a basketful of Easter goodies in tow, your child will be ready to take on the springtime weather and wait for the furry bunny of the hour to finally arrive on Easter morning!